Back in June, guest blogger, Kirk Sorensen, over at Selenian Boondocks described a cool concept for generating artificial gravity from a tether (and a Canfield joint). I read the paper behind the concept. Last week when Jon Goff at Selenian Boondocks followed up with this post about a Variable Gravity Research Facility (xGRF) as a Flagship Technology Demonstrator, it reminded me I needed to post some business applications for such a facility as well. Could such a facility be run commercially? In the discussion below, I will use the International Space Station (ISS) as my example, but the model I present would work equally well with other orbital destinations like a Bigelow Aerospace habitat. For us non-engineers, think of the xGRF as a Bigelow module (habitable volume) with a large tether attached. Because of the power (almost magic) of the conservation of angular momentum, when the tether is unwound, the station spins. When the tether is re-wound, the tether stops spinning (this is where the engineers shoot me for over simplifying – but you get the idea). Because such a station could be spun at various rates, multiple G-Loads are possible. Because the station could be despun quickly, the xGRF station is easier to dock with. Because the station can be despun and respun at a low energy cost, the station is cheaper to operate. Could an entrepreneur run such a gravity facility at a profit? 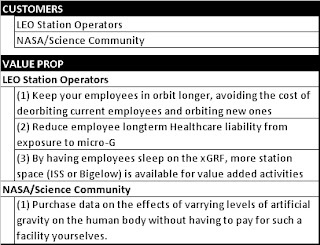 Their profit centers could be both the “gravity service” they offer (a night sleep under gravity) as well as the data they generate from the effects of varying levels of gravity on humans (for use by others in planning long-duration space flights). 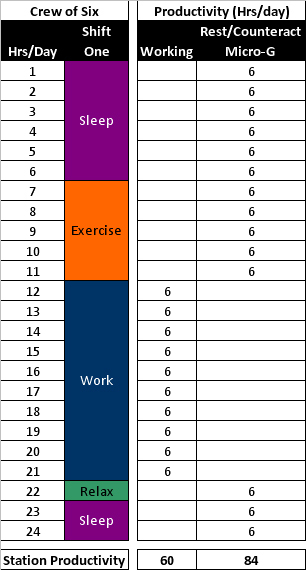 Those guests staying on an xGRF become both customer and lab rat. I don’t think it is too ambitious of a goal to return astronauts to earth with NO LONGTERM NEGATIVE EFFECTS from microgravity. Although obviously not achievable currently, I think we are all assuming humanity has to develop this capability someday – the current system in untenable. Is such life-enhancing effects possible through short bursts of artificial gravity? We do not know. Even if the effects of artificial gravity prove less than completely restorative, as long as you assume the benefit from short bursts of artificially gravity is superior to the current system of significant daily exercise, I believe one could still develop a lucrative market for a gravity service. The option to sleep under artificial gravity could become highly desirable - one of those services that moves from “luxury” to “requirement” in people’s minds very quickly. 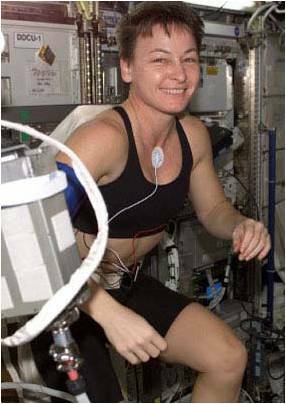 Reduce microgravity physiological impacts on astronauts in orbit. The logistics of frequent dockings are significant. Note these first two challenges are relevant to my last post about the last mile problem for mico-cargo delivery to these stations. If today’s post highlights how we are struggling to solve frequent deliveries for macro-cargo, how pessimistic should we be regarding micro-cargo deliveries noted in my last post? Allowing a spinning station so close to the ISS (or any orbital station) creates security challenges that must to addressed. There is always a chance the two stations will collide. Do the benefits outweigh the risks? 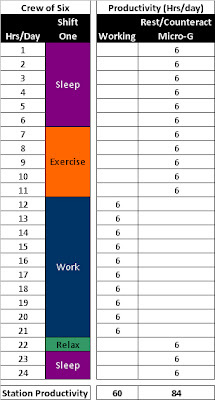 How can the risks be mitigated? Is two hours really enough time to transfer between stations? If not, does the loss of productivity from longer “commutes” (three hours, four hours?) degrade the idea to the point of being unexecutable? 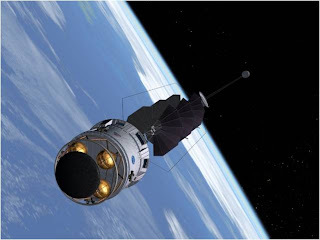 As with most tantalizing space business concepts, this one falls into the category of, “If I only had a billion dollars…” I do like Jon Goff’s idea of developing a xGRF as a NASA Flagship Technology Demonstrator. 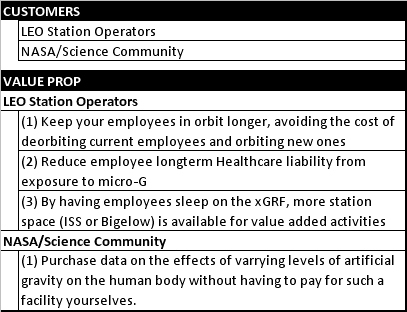 Regardless, once commercial station operators have achieved a few more milestones, this concept may be worth a deeper look – adding productivity to our astronauts in orbit and more importantly, improving the quality of life of those working off-world. Note that the orbits of ISS and xGRF would begin to drift apart almost immediately, unless they were actively maintained by either a tether between the two or propulsion. The commute between ISS and xGRF would eventually become impossibly expensive. Agreed. The tug transport is key. Note I left tug transport section of the post really vague because I don’t know how to do it. 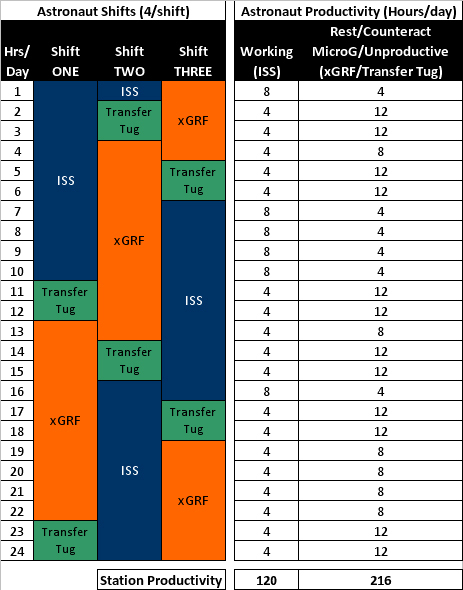 Keep transfer times to under two hours and keep the delta-v req for any tug low. Great. How do you do that? I am not sure. Definitely one of the show stoppers to solve to make the idea viable. Alternatively, one could consider designing stations that contain a microgravity section (for research/entertainment/etc.) and a spun gravity section forcing designers to solve significant vibration issues for any microgravity experiments or manufacturing on board generated by the spin. But those are the options, right? Either (1) have separate space stations for microgravity and spun gravity and shuttle astronauts between the two stations or (2) figure out how to combine both into one facility. Great comments. You are right. The tug transport is definitely a MAJOR challenge. It's been a while since my grad class in orbital mechanics, but I suspect that the precession of the two station orbits with respect to each other will turn out to be cyclical. There should be regular windows during which ferrying between stations is relatively inexpensive. I can't say off hand how often those windows come up. Note, however, that any station in LEO will need periodic orbital boosts to counter drag and such. These boosts could also be used to improve the transfer windows somewhat. Eventually, creative use tethers could be very handy for plane change maneuvers. I imagine that stations combining microgravity sections with spinning sections will also be quite useful. Still, we have a lot to learn about the practical dynamics of spinning space stations. I loved the xGRF proposal.